4K Ultra HD video has become a rushing river nowadays, which can be available on almost any video sharing site such as YouTube, Vimeo, Dailymotion, and be accessible from your daily used devices like camcorder, iPhone iPad, etc. 4K UHD video is near perfect except for one thing - large-sized file. That makes you quite headache when you need to compress and convert 4K video for further usage (share, edit, playback). What a time-consuming task! Fortunately, the time-consuming chore stands a good chance to become a time-saving task as long as you choose a cutting-edge GPU accelerated video converter, which can help you process and convert 4K Ultra HD video with 2-3X or even faster speed. Which 4K video converter supports GPU hardware acceleration? Well, this article is created just for this purpose - introducing 2019 No.1 fast GPU video encoding software powered by Nvidia/AMD to improve 4K Ultra HD video processing speed to the utmost. By taking advantages of GPU hardware acceleration (Intel QSV/Nvidia/AMD), it can encode (4K/HD) video to H264, HEVC, MP4, and other 200 formats at 250-320FPS, 5-8X faster than any other video processing software. What is GPU Video Encoding Acceleration? 1. Both your computer and the video converter software you're using support GPU AMD APP, DXVA or Nvidia hardware acceleration tech. 2. The GPU hardware configuration should at least reach the entry level, e.g., the 1st generation (Kepler) or higher for Nvidia GPU and AMD Radeon™ HD 7000 series graphics for AMD APP. 3. Make sure that the GPU video encoding on both computer and software is the same. If your computer supports Nvidia NVENC while your software features AMD APP, then the GPU hardware acceleration can not be achieved. 4. Upgrade your drive program to the latest version. When everything is ready, then you can go to the next part - looking for a top free GPU accelerated video converter 2019 to make 4K UHD video conversion faster. Which Supports GPU Accelerated Video Processing? Don't judge a book by its cover. Though it's called video converter, actually it's a GPU accelerated video processing tool. Powered by Nvidia NVENC/CUDA and AMD APP hardware acceleration, this GPU video encoding software can process video, esp. large-sized 4K Ultra HD video to H264, H265, MP4, MOV, AVI, MKV, etc. 180+ video and 14+ audio formats up to 250-320FPS, 5-8X faster than any other ordinary video converter. When you convert, compress and edit 4K video, you can experience the No.1 fast speed it offers. On top of the GPU hardware acceleration tech, this 4K fastest video converter also features CPU hardware encoding - Intel Quick Sync Video, alongside with multi-core CPU (up to 8) and hyper-threading tech to further accelerate video (HD & 4K UHD) converting, compressing and editing speed. Some of you worry about the super fast speed is at the cost of output quality. Yet, your fear is unnecessary. MacX devotes every effort to constantly optimize its High Quality Engine, Auto Copy mode and video encoding kernel to improve output quality up to 98% quality kept, virtually untouched by video processing. Step 1: Free download and run this GPU AMD & Nvidia video converter. If your computer supports AMD APP or Nvidia (NVENC/CUDA), the "Hardware Encoder" option will be automatically ticked at the lower right side of the main interface. Note: to make full use of the hardware acceleration techs this 4K video processing tool has, you're suggested to click "Options" at the top banner of the main interface and select how many CPU cores you wanna use in this video processing on "CPU Core Use" option. The default setting is usally using the maximum cores. You can freely adjust it according to the tasks running on your PC. 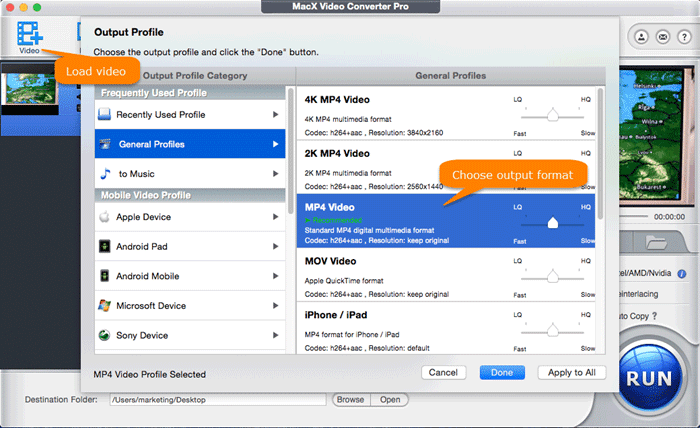 Step 3: Choose the output video format as MP4 (H264) or iPhone (H264) based on your own needs from the pop-up window. Step 4: Click settings icon to compress 4K UHD to 1080p, adjust frame rate or tweak video bit rate. And the 4K video editing feature can also be activated via the scissor-shaped icon "Edit", with which you're allowed to trim and shorten 4K video length, cut off 4K video image border, add subtitles to 4K, etc. Step 5: Click "RUN" button to begin processing 4K video (convert, compress, edit) at GPU hardware accelerated speed. You can see the detailed conversion average frame rate shown on the conversion window. Many users might not be familiar with this media processing tool, but it actually has been existed for a long time since 2005. Though it doesn't rise to fame like Handbrake, this video converter application does a great job in 4K video processing, esp. after it's armed with GPU acceleration tech - Nvidia CUDA/NVENC. Thus, it can improve video converting speed up to 2-3X faster than before when hardware encoding video to H264 codec. Similar to the above mentioned MacX 4K GPU accelerated video converter, MediaCoder also features multi-thread tech and multi-core power to cooperate with GPU acceleration to jointly speed up video conversion process. What this GPU hardware accelerated converter leaves to be desired is the AMD APP GPU acceleration, which is asked by dozens of users on its official forum. That would be much better if MediaCoder can take AMD GPU users' needs into consideration. MacX Video Converter Pro, an all-around 4K CPU & GPU hardware accelerated video processing tool, can convert 4K Ultra HD video to H264, H265, MP4, MOV and compress 4K to 1080p at 5-8X faster speed thanks to the powerful Intel/AMD/Nvidia hardware acceleration techs. Does Handbrake Support Intel Quick Sync Video for Mac? CUDA converter offers you No.1 fast experience in 4K conversion. Read to know if Handbrake supports GPU hardware encoding. Which decoding is faster? Guess and verify your answer. What is Intel QSV Hardware Acceleration? Know the definition of Intel QSV via simple expression.